who won last sat nite? In which class. Hell I will post all of them. 2nd Samatha Williams Got to give it to the girl. That was the 1st time that she had ever drove the Mud Duck since the motor work. I was impressed with her. She did everything herself. That takes guts, not nowing the truck and all. As for the rest of the classes I need to get the paper work out of the trailer. I will have that soon! hell i took 3 3rds last month and had no clue hope to do the sam next sat. by the way what is the points race gonna be for? 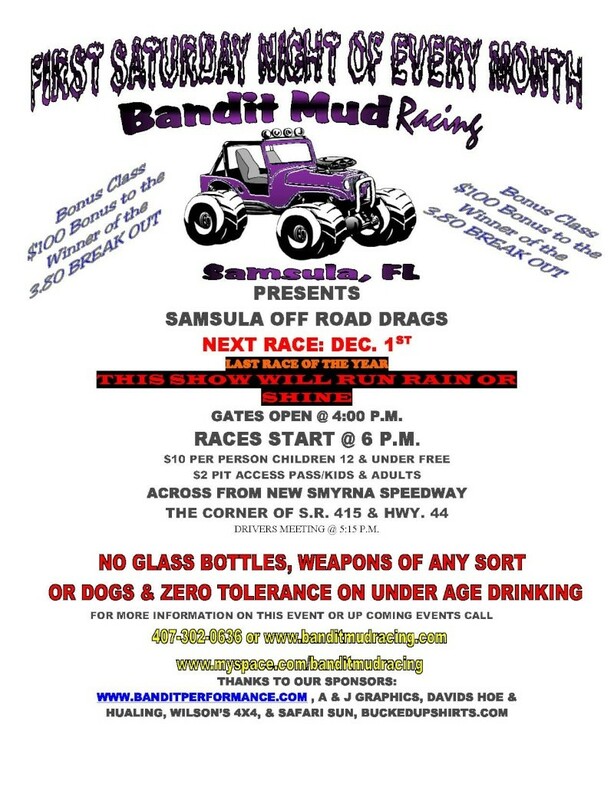 We have been back and forth on what we were going to do, and what Jamie, Wes, myself and Missy came up with was a play day @ the Bithlo track Dec.31. We will have an awards ceremony, food, and mud. You bring what you want to drink. We would have it @ Samsula but we want to keep the track some what fast and smooth forthe January 12th consistency race. allison, just a thought after i talked to you last night . some of us were thinking it would be better on the 31 that way many people can have something to do for the 31 st and do what they love . a few have said it would be cool to turn it in to a a camp out to so when they get done racing they can hang out with friends and have a few drinks and NOT worry about driving home and adding more people to the road with the drunks out there lol ..
Trouble wrote: allison, just a thought after i talked to you last night . some of us were thinking it would be better on the 31 that way many people can have something to do for the 31 st and do what they love . a few have said it would be cool to turn it in to a a camp out to so when they get done racing they can hang out with friends and have a few drinks and NOT worry about driving home and adding more people to the road with the drunks out there lol .. The 31st is out. There is a liablity of having that event that weekend. So I am working on another date. Don't give up yet.